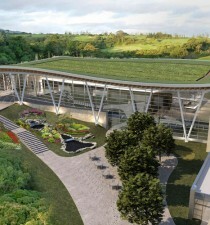 The conference center and dining area will each have a green roof. It was in 2003 that Dennis Blue joined retirement-solutions firm Jackson National Life Insurance Company as its VP of corporate support services. And, it was in the following year that the business began a steady stream of building development to accommodate a growing staff that would eventually comprise more than 4,500 employees. 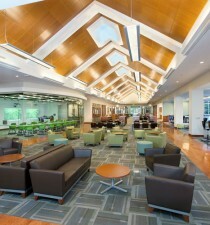 The main component of the expansion has been the ongoing construction of a 275,000-square-foot addition to the company’s headquarters in Lansing, Michigan. 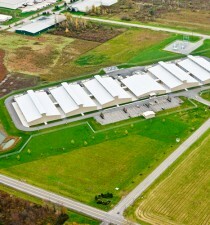 Blue’s ultimate vision for the site had to stay on hold awhile in 2008, though, when the US economy went into free fall, but while the 450 acres of Lansing farmland acquired for the addition sat undeveloped, Jackson continued its expansion through other projects. In 2011, for example, the company opened a new building in Nashville, and it also relocated its Tampa, Florida, office to a new facility. “That was our first deviation from the ‘corporate standard’—the first attempt for Jackson to attract the younger generation,” Blue says. Getting everyone to agree on the vision for the expansion proved relatively easy, Blue says, because Jackson’s top executives were already in line with his team’s way of thinking. “The C-Suite had given a lot of positive feedback for the other sites that we’d built out and were on board with where we were heading,” he says. “Sometimes, though, we had to guide them away from ideas … such as that it made the most sense for the C-Suite to occupy the newer building [once completed].” The executives ultimately stayed put, which made the most logistical sense to Blue. The conference center being attached to Jackson National Life Insurance’s headquarters will have floor-to-ceiling windows for daylighting. Having a solid team proved important early in the building process, when an unusually cold winter froze the soil as deep as seven feet and teams had to employ wrecking balls to soften the ground before foundations could be poured. The fact that the property was old farmland was a challenge as well, and Blue says “a lot of undercutting” was needed to get a compact, supportive soil on which to build. Factor in the fact that the project’s architect was slow on delivering some of the construction documents, and the value of the construction manager was clear from beginning to end, especially when it came to adjusting the overall production schedule. And with the MVP partners adhering to guaranteed-maximum-price contracts, Blue’s team also pushed them to premanufacture and assemble things at their own shops—“not an unusual request, since one of the things we asked during the interview process was ‘what do you build in-house?’” Blue says. 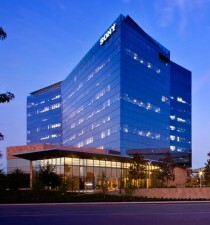 Jackson also completed the relocation of its El Segundo, California, affiliate offices in 2014. With that project, the additions at Lansing, and other recent changes to the company’s sites, Blue and his team are well on their way to providing employees with warmer, more collaborative work environments.